Model Lp01 armchair lamp by Luigi Caccia Dominioni for Azucena. Designed and manufactured in Italy, circa 1970s. Leather and brass. Brass shade adjust positions. Takes one E27 40w maximum bulb. Bulbs provided as a one time courtesy. by Azucena, 1979 Brass metal and leather. LP01 "Lampada Poltrona" by Luigi Caccia Dominioni for Azucena, Italy, 1979. This rare armchair lamp from Azucena features a structure of brass, metal, and leather. Brass wall lamp by Azucena, 1964 Polish brass References: Giuliana Gramigna, Repertorio 1950-1980, Mondadori, Milano, 1985, p. 215. Luigi Caccia Dominioni LP10 wall lamp/applique, Azucena, Italy, 1950s. Brass and glass. Very good vintage condition. Semi frosted glass shade. 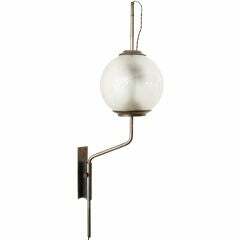 Luigi Caccia Dominioni LP15 'Tromba' wall lamp for Azucena, Italy, 1964 Signed Azucena.